In 2013, after working with Triple Option Football Academy Owner, Lou Cella, Hereford HS (MD) won the Baltimore County Division I Football Conference Championship in Head Coach Steve Turnbaugh’s final season as Head Football Coach. 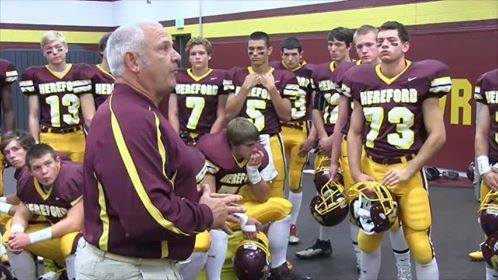 After Hereford’s seventh-straight win in 2013, Steve retired after a 19-year career coaching his son, Brock, and coaching at his alma mater. “We did the academy this past off-season. In my opinion it was worth every penny we invested.We had been running the triple since 2005. I attended Navy clinics, other clinics, bought videos etc….. However, I picked up more during those sessions with Lou than I ever could imagine. If I had questions, Lou was there with an answer. We lost many players from our 2012 team. We were basically starting from scratch with our 2013 team. The academy had us prepared for any situation. Though we started 0-3 (many injuries, including using a # 3 QB) we finished winning the last 7 games. Though this was my last season, I am still involved in the triple option and would run that offense in a second, if I do decide to resume coaching again.